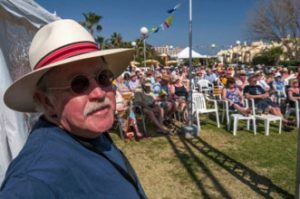 Sunglasses and shorts at the ready, Mike’s off to sunny Spain again shortly as principal compere for the second Costa del Folk Festival. Top bands Steeleye Span, Le Vent du Nord, The Mighty Doonans, Blackbeard’s Tea Party, Stolen Gnomes and Roisin Ban. Legendary guitarist Martin Simpson and superlative singers, Coope, Boyes and Simpson. Great duos O’Hooley and Tidow, Roberts and Lakeman, Gilmore and Roberts, Russell and Algar, the Askew Sisters and the House Devils. Superb soloists Lucy Ward, Bob Fox, Jez Lowe, Billy Mitchell, Steve Tilston, Duncan McFarlane, Jessica Lawson and Elspeth Cowie. Plus a ceilidh every night with Steamchicken, Liam Robinson band, Jam and Crumpet Band, Costa del Folk All Stars and callers Lisa Heywood and John Meechan. There’s another Costa del Folk planned for October, 2015, however. This time on the Portuguese Algarve with a line-up that includes Show of Hands, Seth Lakeman and Barbara Dickson. And the latest news is that Costa del Folk is already planning another festival in Majorca in April 2016.